Expedition Everest looms over Disney's Animal Kingdom. 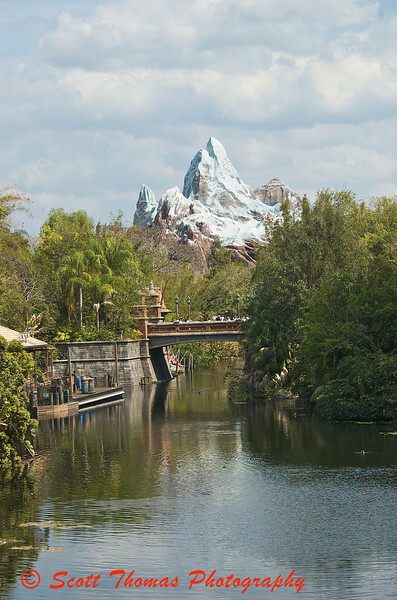 The Discover River leads you into this photo as you follow it to the bridge and then on to Expedition Everest. Expedition Everest looks like a real mountain instead of a man-made structure housing a thrilling roller-coaster ride, doesn’t it? Over the years, the Kodak Picture Spots have become cliche but most are put in places that do tell a story. 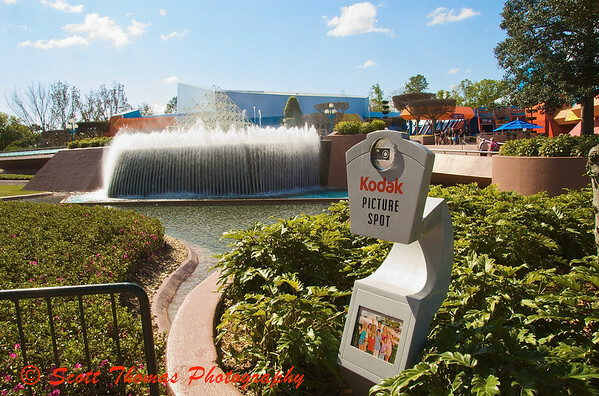 In this photo, the Picture Spot sign becomes part of the story leading into the Journey Into Imagination pavilion area featuring a waterfall which defies gravity. This entry was posted in Assignments and tagged animal kingdom, epcot, expedition everest, florida, future world, journey into imagination, kodak, mountain, orlando, Photography, ride, river, rollercoaster, storytelling, walt disney world, water, waterfall. Bookmark the permalink. I’d love to be a character in your story right about now! I could definitely use some Florida and Disney in my life these days. And Disney World is about one of the best places I can think of for imagining a wonderful story. Great shots, and great examples for your assignment. Interesting shots. Walt Disney World is definitely and iconic place. I’ve not been there since I was about 12. It was a lot different then. Space Mountain wasn’t even there yet. It seems like there are so many great spots for pictures at Disney World – I like the idea of storytelling. Thanks!